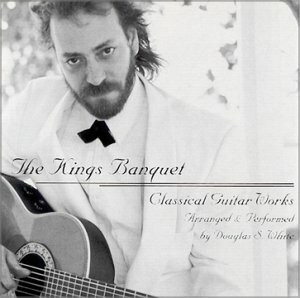 The CD, "The Kings Banquet" are Solo Classical Guitar Works which were Arranged and Performed by Douglas S White. The Repertoire used is from the 16th to the 19th century, Baroque, Renaissance, Romantic and Classical eras are represented in these arrangements. Giuliani, Carcassi, Tarraga, Sor, Molinari, Clark, Bach, Beethoven, Carulli, Handel, Dowland, Purcell, de Visee, W Mozart, L Mozart, Cutting, Sanz, and a few others who were Anonymous are all represented on this CD. In Essence, Track #1, "Romance" stands alone as a traditional work, and Track #2 through #10 is all one arrangement that smoothly transcends from one work to another within each track as well as track to track, always changing but flowing together. Was available on CD at Amazon.com but it's sold out but the reviews are still over there to read if you want, or add to them if you wish. These MP3's Are Free, Enjoy! You can Download My Whole Classical Guitar CD for Free, These Downloadable Files are Extremely High Quality 320kbs except Track 2 which is 256kbs because of size restrictions. for any questions you may have, Above all Enjoy!! !